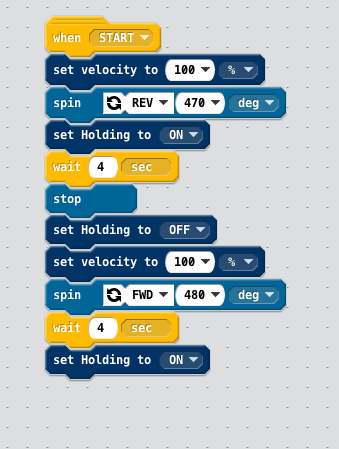 My motors freeze when they get to the forward portion of this code, but sometimes it works. Any suggestions? When I push play from Modkit (with bot plugged in), it actually works correctly. Have you tried adding the “Set Timeout to <> sec” block found in the setup category? If you place it at the start of your code just after the “When Start” block, it should stop the robot from freezing up every now and then. If you set the timeout value to 0.5 seconds then it shouldn’t make much of a difference. What is the stop for in the middle? I only use stop at the end. If I want motors to stop I set the velocity to zero.